With Nets, Jason Collins Will Be NBA's First Openly Gay Player : The Two-Way Jason Collins, who signed a 10-day contract with the Brooklyn Nets on Sunday, will be the first active openly gay player in NBA history when he takes to the floor with the team. 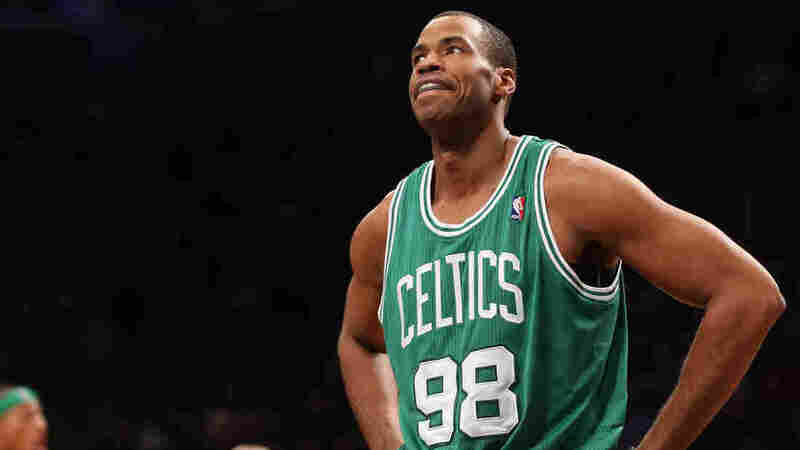 Jason Collins, who played for the Boston Celtics in 2012, signed a 10-day contract with the Brooklyn Nets on Sunday. Collins came out as gay in an article in 2013. Jason Collins, who announced last year that he was gay, will be the first active openly gay player in NBA history when he takes to the floor for the first time with the Brooklyn Nets. Collins signed a 10-day contract with the Nets on Sunday, and is expected to be in uniform against the Los Angeles Lakers Sunday night. It will be his first NBA game since coming out as gay in a Sports Illustrated article in May. He became a free agent after the 2012-2013 season and remained unsigned. Collins will be in familiar territory, as he spent his first six-and-a-half seasons with Nets when the franchise was in New Jersey and helped them reach two NBA finals. With the need for a big man to assist with interior defense and rebounding, the Nets once again turned to the 7-foot-tall center. "The decision to sign Jason was a basketball decision," General Manager Billy King said in a statement. "We needed to increase our depth inside, and with his experience and size, we felt he was the right choice for a 10-day contract." Collins will also reunite with former Nets teammate Jason Kidd, who will be in his first season as the team's coach. The signing of Collins comes as Michael Sam, the SEC defensive player of the year who announced recently that he was gay, is taking place in the NFL combine to perhaps cement his place as the first openly gay player in the league.